A specialized gift basket is a thoughtful and useful gift to put together and give to a friend or family member. 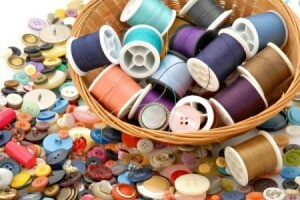 This is a guide about sewing theme gift basket ideas. My sister got a basic sewing machine for Christmas and wants to start making things. For her birthday in February I decided to make her sewing themed gift basket with some of the basic necessities (thread, buttons, seam ripper, needles, thimble, scissors, tape measure, pin cushion, some basic patterns, etc.) all in a sewing basket for her. You could get any lidded basket and line it with padding and an attractive fabric on the inside and top if you want.